I live and die by my lists. Because of a recent conversation I had with my mom, I realize that I am missing a couple of lists. As a pre-New-Year’s resolution and holiday-survival exercise, I have created two more TOP PRIORITY lists. MY BURDENS LIST and MY JOYS LIST. November was tough, and December isn’t looking much lighter. There is illness and injury, friends struggling with divorce, people moving and parents dying. It is a list that can get heavy and depressing, but to pretend that those things aren’t going on is not a healthy decision. So I make my burdens list. I write out those things that are weighing on my heart and I put all of that heaviness onto paper. I give each item the respect it deserves and I breathe slowly… exhaling the ugly emotions that come with the bad parts of life. On my second list I lay out the joys and blessings in my life. There are my kids, my marriage, our heated home, weddings, parties, family gathered for holidays, good friends and support that matters. There is laughter and happiness too. I put all of that down on paper and I imagine if I were to lay the JOYS list on top of the BURDENS list it would be light enough to lift both pages off the desk. I read a recent blogpost by one of my favorite parent writers. The blog is called Privilege of Parenting, and the man behind the prose writes often about the balance of life. His latest musing dealt with a riding machine called a Fixie. I hadn’t heard of it, but he explains that the rider can get the machine to go either forward or backward with petal motions. We, people, are the third dimension in these polar forces. Life wants to pull us forward and backward, up and down, and it is up to us to bring it all into a center to keep it all balanced. It is easier to get caught up in the negative, or to put on a face of positive without acknowledging the hard parts. It is easier to stay lost in a positive memory or to spend endless amounts of energy in the planning-for-the-future phase. What is difficult, but necessary, is acknowledging our place in the middle and writing our lists accordingly. ← Sports Parent or Sports Fan? Great post. I decided a long time ago that life is a constant mishmash of good and bad. One rarely comes without the other in tow. Balance is a constant juggling act. Perspective is sometimes difficult to find when I have my head down getting on with life. That’s when I have to remind myself to stop and look up, because when I do, there are my loved ones, there is the wonder of nature and there is the warmth of my home. Have a wonderful festive season. Great post, Meagan. I have trouble with the “thankfulness” movement and counting blessings because to me it feels like negating all the tough parts of your life. I know that sounds dumb but that’s just how my mind works. I love your idea of making a list of both blessings and troubles. Such a simple and yet powerful tool! Great post. Being a list maker myself, it is always the balancing. 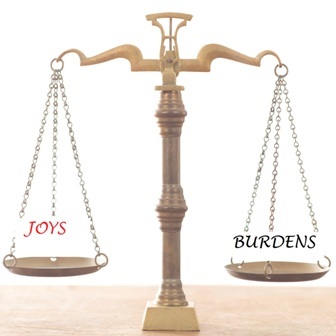 I love thinking about putting the joys list over the burdens. Thank you.